Indu is building a busy practice in all areas of family law. She has gained experience across multiple levels of court, including the High Court. Indu obtained tenancy after successful completion of her pupillage at 4 Paper Buildings. Her instructions have ranged from: private children law matters where there are allegations of parental alienation; international children law matters, from relocation of children to representing clients in the High Court at all stages of Hague Convention 1980 proceedings, and wardship; children fact finding hearings (public and private law) concerning allegations of sexual and physical abuse; and financial remedy hearings involving issues such as the enforceability of pre-nuptial agreements. Indu is regularly praised for her reassuring and calm manner with clients and her ability to listen carefully to their concerns enabling them to feel confident in her abilities. 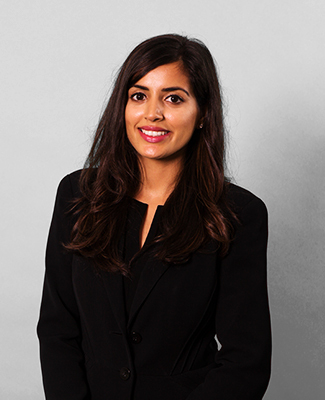 Indu won the Jordans Family Law Award for Young Family Barrister of the year 2017. Away from court, Indu has presented seminars to solicitors and other legal professionals on a range of family law topics. Indu has delivered witness training to Psychiatrists within the Royal Society of Medicine’s Child Mental Health Team. Prior to commencing pupillage, Indu worked as a Family Paralegal for Practical Law, where she helped to establish the family service. She also volunteered for Just for Kids Law as a legal caseworker in the Education and Community Care department. Indu’s previous voluntary experience includes acting as an Immigration Tribunal Friend assisting litigants in person and as an English Teacher, working at a school and an orphanage in Siem Reap, Cambodia.